Command of the Royal Canadian Air Force changed hands at a ceremony held May 4, 2018, in Ottawa. 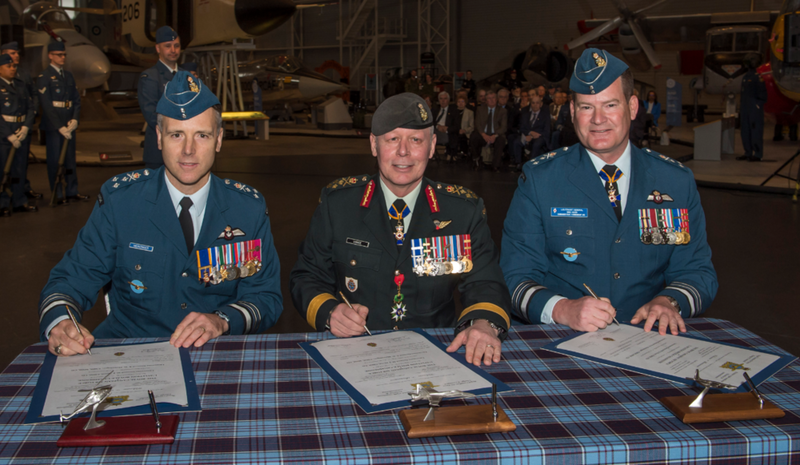 The new commander of the RCAF, Lieutenant-General Al Meinzinger, assumed command from Lieutenant-General Mike Hood at a ceremony held at the Canada Aviation and Space Museum in Ottawa and presided over by General Jonathan Vance, chief of the defence staff. Lieutenant-General Meinzinger enrolled in the Canadian Armed Forces in 1985. In 2006, he assumed command of 403 Helicopter Operational Training Squadron. In 2011, he deployed to Kandahar, Afghanistan, to command Canada's Joint Task Force-Afghanistan Air Wing, overseeing the final phase of Air Wing support to combat operations. In July 2013, he took command of Royal Military College of Canada in Kingston, Ontario. Upon promotion to major-general in May 2015, he was appointed deputy commander of the RCAF. In March 2017, he was appointed as director of staff, Strategic Joint Staff. He was promoted to his current rank on April 20, 2018. The RCAF provides the Canadian Armed Forces with relevant, responsive and effective air power capabilities to meet the defence challenges of today and into the future. The Commander of the RCAF ensures that trained personnel, along with the necessary equipment and support, are available and ready to carry out air operations in Canada, in North America and around the world when called upon by the Government of Canada. The RCAF provides support to organizations such as the Royal Canadian Navy, Canadian Army, Canadian Joint Operations Command, NORAD, NATO and the United Nations. The RCAF comprises 13 wings as well as other entities, located across Canada. The wings conduct Air Force operations and training under the direction of the commanders of 1 and 2 Canadian Air Divisions (as well as the Canadian NORAD Region). In addition to 1 and 2 Canadian Air Divisions, the RCAF Aerospace Warfare Centre has recently been confirmed as the third pillar of the RCAF’s organization, driving change and enabling innovation and transformation. The RCAF includes approximately 12,000 Regular Force personnel and 2,100 Air Reserve personnel (Primary Reserve and officers of the Cadet Instructor Cadre). Approximately 1,500 civilian public servants are employed within the RCAF organization.